Defenders of the House spending bill have argued that despite its $2.1 trillion debt impact, it is necessary to prevent the return of sequester-level spending caps. This claim is at best a half-truth; the spending bill would increase spending twice as much as fully repealing the sequester and effectively reverse the spending constraints agreed to in 2011 on a bipartisan basis. The Budget Control Act of 2011 (BCA) included two sets of discretionary spending caps: defense and non-defense. Both parties viewed these caps as reasonable or necessary, and the failure of the so-called Super Committee to find the agreed-upon deficit reduction set in place a $90 billion per year reduction ("sequestration") to those caps. There is broad agreement that the sequester-level caps are too low, which is why policymakers enacted sequester relief for 2013 through 2017 that set the caps between pre- and post-sequester levels. These deals provided appropriators with sufficient resources and were generally responsibly offset with mandatory savings and revenue. Sadly, lawmakers abandoned this approach last year, enacting a two-year cap deal that increased spending more than either side asked for and included few offsets to cover the cost. The current House spending bill would be even worse. 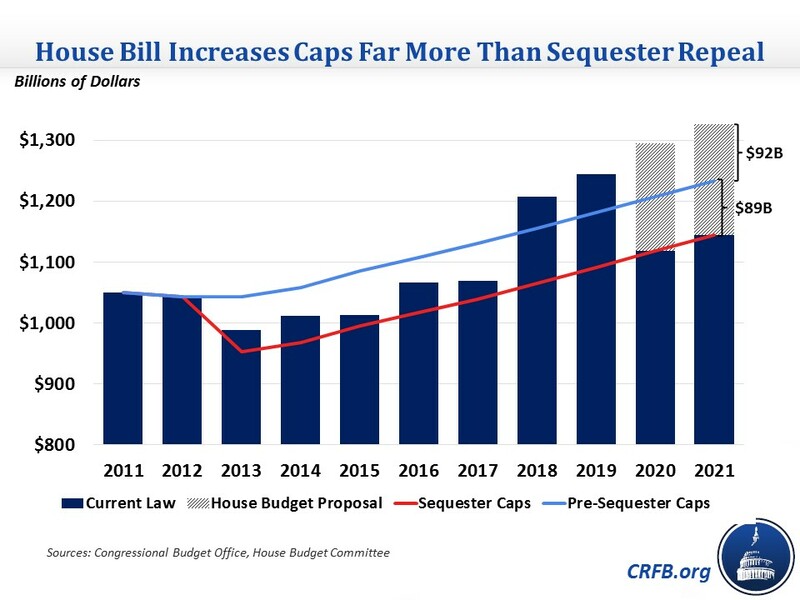 The House bill increases the spending caps by $177 billion in 2020 and $181 billion in 2021, twice as much as what it would take to end the sequester. On the non-defense side, cap increases would be almost 2.5 times as expensive as full sequester repeal. And the bill includes no offsets. The House bill wouldn't just repeal the sequester; it would essentially end all the defense and non-defense spending constraints both parties agreed to in 2011. It would also set the stage for historically high spending levels beyond 2021, when the budget caps are no longer in effect. While we have long supported responsible sequester relief, there is little justification for repealing the sequester cuts twice over, especially without spending or revenue offsets. Now is not the time to add $2 trillion more to the national debt.